I wasn’t expecting to blog a card today, but I was rifling through my stash of panels that I had coloured and I made a quick card. Well it’s never quick, but quicker than normal. I am eking out the last few days of summer with a pretty floral card for you today. This panel was coloured back in May whilst I was watching the Royal Wedding and I tried to replicate the colours that Harry and Meghan had chosen for their flowers. If you watched the wedding you may remember that amazing festoon of flowers that tumbled around the archway as they left the church. 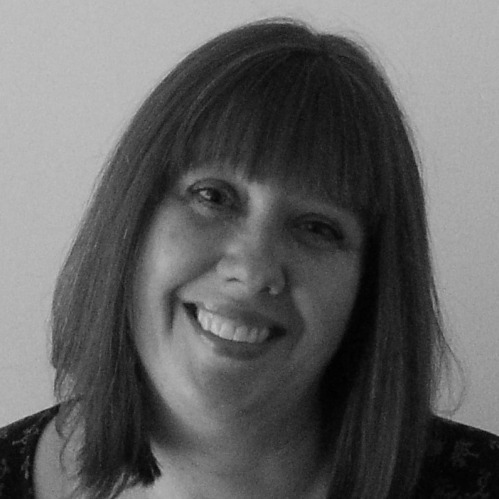 Full of dark green, light green, soft yellow and cream – absolutely stunning. I am not sure I got the colours exactly right, but they are almost there. The aptly named floral is from Clearly Besotted and is called On Your Day and it was stamped with Versafine Onyx Black Ink onto Strathmore Bristol Smooth cardstock. I coloured it with my Zigs – the colours are Yellow, Bright Yellow, Pale Green, Light Green, Deep Green, Light Gray and Gray. As always I worked in layers, used a waterbrush and let the colours dry in between applying the next layer. Dark Green and Grey were used in some of the crevices just to give a bit more depth. I trimmed the panel down, added some DST onto the back and then adhered it to a A2 top folding Fog cardstock base. The sentiment is from Just Saying – this is a fabulous sentiment set from Clearly Besotted which has only just been released. 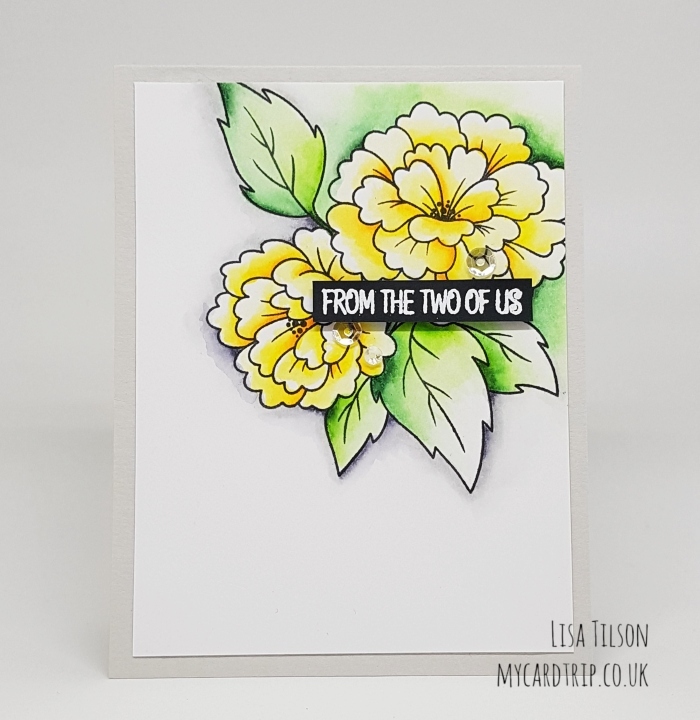 It has sentiments that can be used the whole year round and I thought “From The Two Of Us” would be perfect – this card is now suitable for a multitude of occasions. Some foam tape was added to the back of the sentiment which had been white heat embossed on black cardstock. It was popped up on the panel and a few sequins added for embellishment. 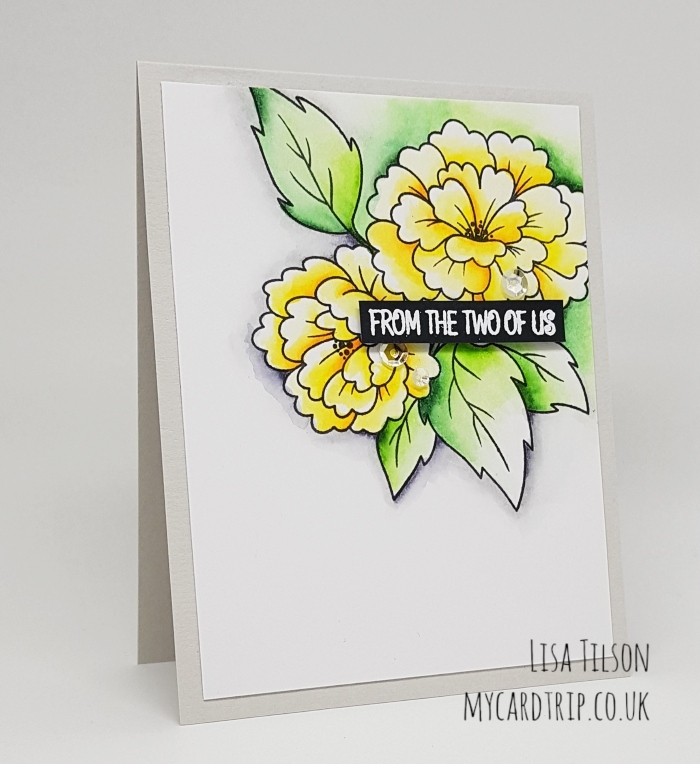 I am not sure it’s quite creamy enough to replicate their amazing floral displays – yellows are always tricky to colour for me and I usually end up going a bit too bright, but I do like how it ended up. Thank you for your visit today, I appreciate you stopping by. Gorgeous floral, what an appropriate name & such a great memory to go with it. Thank you for sharing. Your card is so beautiful. I,m not sure if it’s the same ,but is close enough.